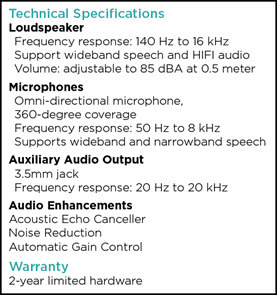 Logitech recently released the Logitech Mobile Speakerphone P710e ($169), a new, mobile based, peripheral. We reached out to learn more about the product, and what this means in terms of Logitech strategy. Allen Smith, Logitech Sr. Global Product Manager, gave us the details and shared some behind the scenes Logitech market goals. We also managed to get our hands on one of the speakerphones so that we could check it out for ourselves. 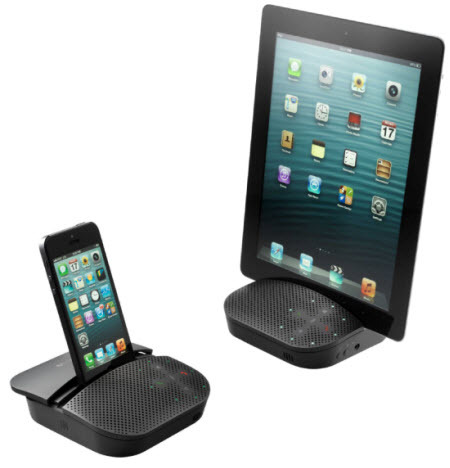 The new product is a wireless, speakerphone for any USB (PC, laptop) or Bluetooth device (tablet / smart phone). Please watch the video above for a quick demo and some commentary. Overall, I really like this product. To the point that I now get annoyed if I have to take a call on my iPhone without it. It is just nice to have a conversation without having to strain to understand what people are saying, or having to hold a phone up to my face. Obviously, these are the basic benefits of any quality speakerphone, but this particular product wraps up those benefits in an affordable, easy to use package, with a number of power features. It is fair to say it changed the way I use my iPhone, and that this is a product I will continue to use after completing my review. Here are my thoughts (in no particular order) in regards to a few specific features and aspects of the speakerphone. 1. Battery Life: Exceptional. It is advertised as 15 hours on a full charge, and roughly lasted me 2 or 3 days of medium use (a fair amount of calls and music, not running constantly). What I really liked is how fast it charges. From a completely dead battery, after only 15 minutes of charging it can run for 2 hours, so you can get up and running quickly. 2. Audio Quality: Wideband audio makes a difference. Studies show it helps with comprehension and collaborative productivity. Logitech also boasts of its advanced DSP, or digital signal processing, which is a fancy way of saying they are tweaking the signals to make things sound better. It did sound very good, and more powerful than I expected based on its size. In fact, when demoing the product to friends and family they would get visibly surprised when I would "turn it up." Using this for music, videos, and games on the tablet and phone is a no brainer. Echo cancellation worked fine, and although I did not test it, Logitech claims it has superior background noise cancellation, which would let you theoretically use it in noisy offices. 3. Product Design: Logitech really went above even their high levels of slickness when it comes to the design of this product. Its general look and feel, the button design and layout, even the indicator lights are just really well done in terms of ergonomics and usability, as well as appearance. Watch the video above to see me geeking out over the buttons and lights. They even got the cord right, as it neatly wraps up and tucks itself into the bottom of the speakerphone. The carrying case is the final nice touch. 4. User Experience: It just works. The Bluetooth connected easily, first try, with every device I tested. You just use your device as you normally would to make calls, play music or games, watch videos, etc. No training or instruction manual is required. You turn just it on, and suddenly your devices have great audio. 5. It's Also a Stand: This is a nice feature that really makes this device a little more than just a speaker. Popping a tablet up on the P710e basically gives me a third screen on my desktop, which I can also use as a dedicated executive videoconferencing device. After using it for a few weeks, I noticed that it adds a level of convenience to my workflow that I had not anticipated. With the P710e sitting on my desk, it is always easy to answer a phone call, regardless of where I left my actual phone. Usually when my phone rings, I have to scramble to dig it out from wherever I left it. This product makes the physical location of my iPhone irrelevant when I get a call. Your phone can be in your pocket, purse, desk drawer, or another room entirely. It doesn't matter, when it rings, you answer on the Logitech. I am sure I am not the only person who has had to take a meeting huddled in a corner of the office by an outlet so my phone could charge. Now, your phone can be charging in a room down the hall, while you take calls at your desk. Note: The physical separation of your device and its audio output can lead to some interesting dynamics. For example, let's say you use speakerphone with your iPhone for a meeting in the company boardroom. Afterwards, you go back to your office to sneak in a quick game of Angry Birds. If the speakerphone was left on, your co-workers may hear your game sounds out of the P710e, and you will never hear the end of it. I have been using and reviewing Logitech products for a number of years for obvious reasons. Particularly, their dominant line of webcams have been a big part of the visual collaboration story. Despite their success, this is not a time for Logitech to rest on its laurels. It is no big secret that tablets and smart phones are eating into the PC market. For many people, these devices can serve as their primary computing platform. Give them Facebook, Candy Crush, and Email and they are set. As goes the PC market, so goes the PC peripheral market. Logitech's leading desktop webcams, keyboards, headsets, and mice are often simply the default purchase, and have a great reputation for quality, cool design, and cutting edge features. Logitech really hit the PC peripheral market perfectly. Using mice as an example, they realized that hundreds of companies would flood the market with cheap mice. At the same time, there are relatively few buyers for really expensive mice. The sweet spot for Logitech is higher quality, yet still affordable products for the mainstream buyer. Again, using mice as an example; I don't want a $10 mouse that will make my hand ache, but I don't want to spend too much on a mouse. I need a mid-priced mouse for about $40-$100, and I want it to be cool. This formula has worked for Logitech in a number of PC peripherals, where they enjoy strong sales and great reviews. But it doesn't really matter how great your PC peripherals are if people are buying less PCs. Logitech needs to follow the trend, and embrace the smart phone / tablet future. The viability of this strategy has already been confirmed. Allen shared with me the fact that Logitech's iPad Keyboard Case has been a huge hit. Apparently to the point where it's success is helping guide product development and strategy at Logitech. All the pieces seem to be in place for this particular speakerphone. The market wants to use their own mobile devices; BYOD is very real, and there is a clear need for quality, affordable, peripherals to improve the experience. With both the mobile market, and the speakerphone market, currently growing at impressive rates, this product is riding two waves. Perhaps most importantly, the product itself is really well done, and is at a fair price point considering its functionality. This is absolutely budget-able for a home office, and a very easy choice for a shared resource in the company meeting room. 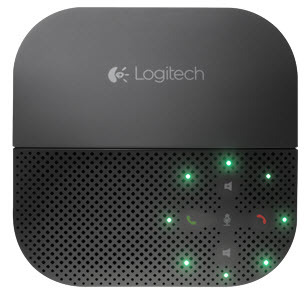 Logitech recently released the Logitech Mobile Speakerphone P710e (\$169), a new, mobile based, peripheral. We reached out to learn more about the product, and what this means in terms of Logitech strategy. Allen Smith, Logitech Sr. Global Product Manager, gave us the details and shared some behind the scenes Logitech market goals. We also managed to get our hands on one of the speakerphones so that we could check it out for ourselves. 2. Audio Quality: Wideband audio makes a difference. Studies show it helps with comprehension and collaborative productivity. Logitech also boasts of its advanced DSP, or digital signal processing, which is a fancy way of saying they are tweaking the signals to make things sound better. It did sound very good, and more powerful than I expected based on its size. In fact, when demoing the product to friends and family they would get visibly surprised when I would \"turn it up.\" Using this for music, videos, and games on the tablet and phone is a no brainer. Echo cancellation worked fine, and although I did not test it, Logitech claims it has superior background noise cancellation, which would let you theoretically use it in noisy offices. Logitech's leading desktop webcams, keyboards, headsets, and mice are often simply the default purchase, and have a great reputation for quality, cool design, and cutting edge features. Logitech really hit the PC peripheral market perfectly. Using mice as an example, they realized that hundreds of companies would flood the market with cheap mice. At the same time, there are relatively few buyers for really expensive mice. The sweet spot for Logitech is higher quality, yet still affordable products for the mainstream buyer. Again, using mice as an example; I don't want a \$10 mouse that will make my hand ache, but I don't want to spend too much on a mouse. I need a mid-priced mouse for about \$40-\$100, and I want it to be cool.